My cell phone rings and I look at the name of the caller. It’s Jared Bybee, BLM wild horse manager for the Pryor herd. “Hi Jared,” I answer cheerfully. His voice is calm and measured. “The darting crew saw Cloud yesterday shuffling down Sykes Ridge Road alone.” Everything after this is a bit of a blur. I remember Jared saying that Cloud is “all beat up and looks thin.” I tell Jared that I’m planning on coming up in a few days. He pauses, and from the tone of his voice, I sense he fears I may arrive too late. Linda Hanick, our Facebook manager and Paula Todd-King, our director of communications decide to go with me. Along with our loyal companion, Quinn, we leave Colorado early, hoping to get up on Tillett Ridge while it is still light enough to glass over onto Sykes. If we can spot Cloud, this will give us a clue where to begin our search. The chilly wind whips around us as we start glassing with our binoculars, hoping to see a flash of white. When this proves unsuccessful we set up both scopes and began dissecting the distant landscape, one canyon and hilltop after another. “I see a pale horse,” I sing out and zoom in. “It’s Echo,” I say, trying not to sound disappointed. First Paula, then Linda peer through the scope. “I think he’s by himself,” Linda says in surprise. Echo is the son of Bolder and Cloud’s grandson. He has nursed his black mother for his entire life, a situation his mother seems to relish. Echo is her only offspring and Bolder has been ambivalent about kicking him out. “Echo looks like he’s getting close to another band,” Paula reports, and I man a scope, watching Morning Star back the beautiful palomino off. Darkness surrounds us as we bounce back down Tillett in the UTV. I flip on the lights and Quinn’s gaze locks on the road, hoping to catch a glimpse of a cottontail. I believe that all three of us humans are wondering the same thing. Where is Cloud? And is he still alive? Saturday. We drive past the Red Buttes and climb to Dead Indian Mesa on lower Sykes above Turkey Flat. Ann Evans and I saw Cloud and his family in the desert last April, and I wonder if he won’t retreat down there to hide and heal. We hike out on the mesa to an overlook. Turkey Flat sprawls below us. As we glass into the flats we notice that Nancy Cerroni has pulled up on the country road far to the southwest of us. She begins hiking toward the flats as we begin glassing. “Ohanzee.” I try to stay calm as I identify the blazed face son of Cloud. The smokey-black colt is unmistakable. We set up the scope and identify Innocentes with her little daughter, Orielle, born at the very end of September. The three are with a black stallion. “Ohanzee.” But there is no way we can identify him from this distance. Where is Feldspar? Cloud’s beautiful grulla mare, the mother of Ohanzee, Encore and Mato Ska are nowhere to be seen. Nancy is hiking now. We text her what we are seeing and where. 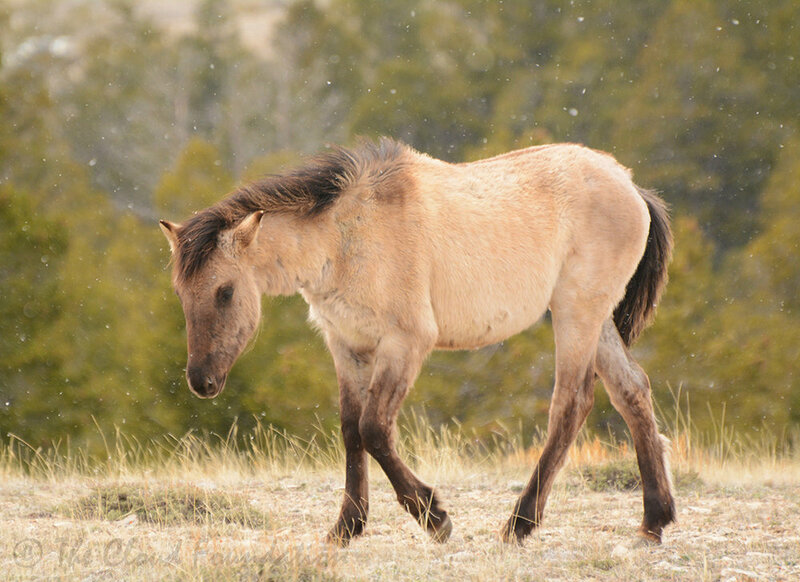 She crosses the Administrative Pasture and navigates through red canyons to the mouth of Big Coulee. When she hikes up onto the flats she spots the new band, and identifies the stallion as Inniq. Almost one year ago to the day Ann and I watched Cloud easily dispatch the five-year old stallion when they sparred on Turkey Flat. Assuming Inniq can hold on to Innocentes and the foals, will he keep them in the low country where he has grown up? He has never been to the mountaintop. But there are more pressing questions weighing on us. Where is Feldspar and is she all right? Did something happen to her during the battle to win Cloud’s family? Might she be with Cloud, if Cloud is still alive? We hike back to the UTV and head up Sykes, travel through Cougar Canyon and inch our way around treacherous Dead Biologist’s Curve and onto a rise where we get out to glass onto the open meadows of Sykes. Just above us we see a very familiar face. Mato Ska, Cloud’s unusual blaze-faced blue roan son is grazing near the dark bay bachelor, Sante Fe who is just two weeks older than Cloud. As we reach their ridge, Sante Fe ambles over to eat snow and Mato Ska (silver bear in the Lakota language) goes to join him. The new three year-old is sporting a nearly white spring coat. I wish you could tell us where your father and mother are pretty boy, I think to myself. Late in the afternoon, we leave the bachelors and drive back down the mountain. The sun is setting over the Beartooth Mountains, bathing the Red Buttes in the last rays of sunlight. Where are you Cloud? And can you see this beautiful sunset? Easter Sunday finds us once more on Sykes, climbing out of Cougar Canyon and squeezing around Dead Biologists Curve. What else did Jared say when he called me? Something about Dead Biologist’s Curve, and a water catchment. I quickly text Nancy, asking her where there is a water catchment around here. She answers immediately: It is just above the Curve. Suddenly, Fool’s Crow and his band come trotting off the hilltop to our right, crossing the road in front of us and disappearing out of sight. I pull over and we begin hiking. When we crest the hill to our left, we see the band drinking at the catchment. If the BLM saw Cloud near here five days ago, might he come back? We set up the scope on the hill above the catchment. He Who’s band is far above us, and what must be Custer's family on a distant downslope above Big Coulee. When Paula and Linda start back to the UTV to grab our lunch, I walk downhill a bit to the south of the catchment and crest a little rise. Cloud!! He looks up from less than 100 feet away. I wave as I always do, and he immediately starts to eat again. He’s alive! We spend the afternoon sitting and watching him eat. As he walks around, we can see that he’s not lame and has only superficial abrasions. His head is a mass of scrapes as if he skidded on gravel. How strange, I think. He is so very thin. I think of the first time I saw him nearly 20 years ago and the words I used to describe the newborn that tottered past my camera. “He’s so thin–I can count his ribs. Are they all so frail, or just this little one?” He isn’t little anymore, but he is frail to be sure. Cloud grazes over the hill and out of sight. Just then another band arrives to drink. It ‘s Hidalgo. Cloud reappears and whinnies. How did he do this? The frail stallion has transformed himself, somehow puffing up to look almost like his old self. Remarkable. Then Hidalgo goes into action, racing toward Cloud. Back up. Run! I think to myself. But, Cloud is the warrior he has always been, holding his ground and striking out at the far younger, far fitter stallion. He kicks out at Hidalgo—one of those lightning fast blows he is so famous for. Then he spins, and bites, but Hidalgo does not give ground, pushing the older horse away. Then Hidalgo trots back to his family. Thankfully, Cloud does not pursue the dun. What can you say, but wow. Cloud disappears back over the hill. Before we leave, we spot Innocentes with the foals and Inniq several ridges below us. The mare is leading the family uphill. NO! I whisper. An altercation now could kill Cloud. Stay away girl. Stay away. We lose sight of them and I hope they have turned back toward Big Coulee. Monday. The weather is deteriorating so we delay going back up Sykes and drive into the horse range on the paved road. 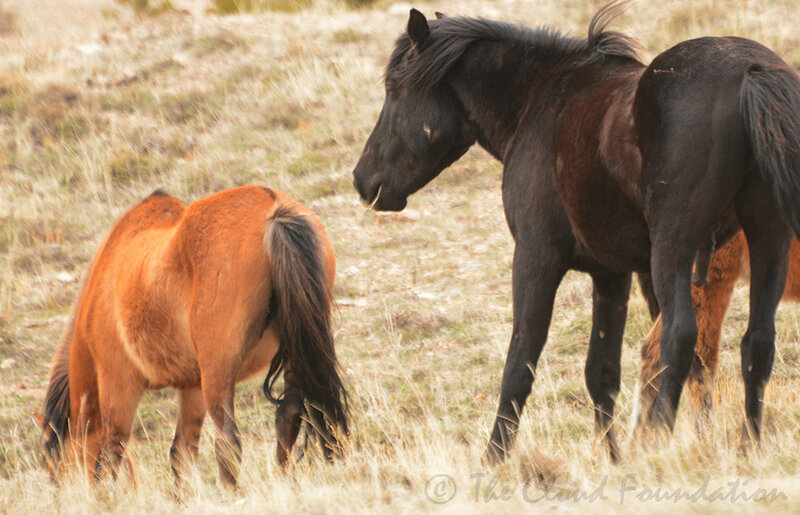 It takes only seconds to see Hickok’s mares, Hightail, Seneca, Kitalpha and Nova, drinking on the opposite side of the lake from their agitated, young band stallion. Hickok whinnies for them and trots along the lakeshore. I look for a place where the mares may have crossed Crooked Creek but see none. Despite the calls of their stallion, they calmly meander onto higher slopes above the water. Once water is released upstream from the Yellowtail Dam this area will be inaccessible and if the mares stay over there, they will be marooned. Two days later we're relieved to see the band reunited on the “safe” west side of the lake. Despite clouds flowing over the ridges of Sykes in giant waves, we head up. As we climb out of Cougar Canyon, I feel like we’re traveling back into winter. Fog enshrouds us and frost has flocked the trees and bushes. We hike once more onto the ridge where we last saw Cloud. Realizing that we’ll have to be within feet of Cloud to see him, we split up and begin searching. Frost is falling from the limber pines when I spot a stallion disappearing in the fog. I have just enough time to snap two pictures. On later inspection, I identify the bachelor as Johan, the stunning six year-old son of Greta and Bistol. If Cloud had been anywhere nearby, I’m confident he would have interacted with Johan. Tuesday. Our plan for the day is to look for Feldspar, glass onto Sykes for Cloud, and find Encore. A young ewe is foraging on mountain mahogany at the overlook, and near her is the bachelor stallion Johnston, napping in a sheltered opening. At the far end of the range, we find young rams and ewes resting together in the sun near the teepee rings. Not bad for an hour’s drive! By mid-morning we’re back up on Tillett. 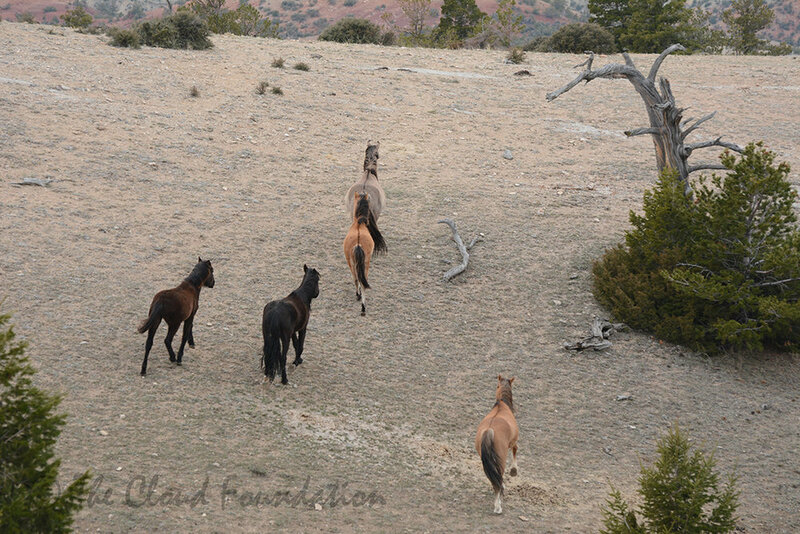 Below the mines we see the elegant stallion Hernando with Cloud’s mother, Phoenix, and my Trace’s mother, War Bonnet. Firestorm’s son and daughter, orphaned last year during Doc’s rampage, were taken in by the kindly young stallion. Maelstrom, the coming 3 year-old colt, stands proudly beside Hernando. The band looks good for April, a month when many of the horses look their worst. Above the mines we glass onto Sykes, spotting He Who’s band again and what looks like Custer’s family. Then, when we start methodically glassing with the scope, we see a suspicious looking light spot, zoom in and focus. Cloud! He is grazing on the open slopes, not so far from where we first saw him. Can you see him? It’s hard to describe seeing him again, even from afar. I feel like every day he can survive he will grow stronger and, just maybe, he will again appear on his sacred mountaintop this summer. Late in the afternoon, we start back down Tillett and just west of the mines hill on a cliff face we notice something glowing. I know before we raise our binoculars that we’ve found Encore. The late afternoon sun illuminates Cloud’s filly daughter, and I think of what a young friend of mine said when she saw her for the first time: She’s like a fairy princess. It is true. There is something very special, almost mystical about Encore. Following Encore through the junipers is Knight. The small, dun roan stallion was orphaned as a foal when his mother, Guinevere died. He was befriended by the biggest horses on the mountain—the Forest Service bachelor boys, Hernando, Hamlet, Grijalla, Garay, and Inali. When Hamlet, Inali, London, and Knight stole Encore almost a year ago, Knight, the smallest among them, claimed the yearling filly. But Inali has been dogging Knight ever since and their frequent fights last summer were sometimes brutal. We continue to glass over onto the cliff but do not see Inali. Has he given up? I hope so. I think everyone who knows the remarkable story of Knight and Encore is rooting for Knight to prevail. The sun is setting as we drive below the mines. We see horses on the hill above the water catchment. Through our binoculars we identify Mescalero’s band. But, who is the grulla horse with them? Then the grulla looks up and I see the broad blaze. Feldspar!Paula, and Linda and stay with the UTV and I nearly vault uphill, trying to out run the setting sun. Is it simply coincidence that Feldspar has returned to the band with her mother, Rosarita? Broken Bow and Half Moon stare at me as I take their picture and move quickly around them toward Feldspar. Feldspar calmly grazes on top of the hill, then looks up as shadows overtake the valley floor below her. I notice her plump tummy. Are you pregnant girl? I fairly float back to the UTV. Feldspar is alive! And I think she is going to have Cloud’s baby! Our final trip up Sykes, Paula, Linda and I again search the ridge where we saw Cloud on Sunday. We’re confident this is close to the spot we saw him through our scopes yesterday. Instead we find Innocentes, Inniq, Ohanzee and Orielle! We watch the foals affectionately groom each other and I feel relieved that Orielle still has her big brother. I will always wonder how Feldspar came to be on Tillett while her son is on Sykes. I notice Inniq sidling up to Innocentes and the strangest feeling comes over me. I get the sense that Innocentes has led the band back to the spot where Cloud battled and lost his family. Of course, I can’t prove this, but I have seen Innocentes demonstrate her affection for Cloud on many occasions. At times she was so clingy that he gently pushed her away. I believe she is waiting for Cloud. We continue on. Brutal winds out of the north begin to batter the ridges of Sykes, nearly lifting the UTV off the ground. As it begins to snow, we see bands trying to escape the gale force blast. Flint, Morning Star, Indigo, He Who and Hamlet’s bands are all within a quarter mile of each other. They stop when they drop into the lea of the hillside. Flint’s youngest, Olivia, has wintered well as has her stocky father. It seems like yesterday when Flint was Olivia’s age. I will never forget how nurturing Cloud was of little Flint, his first foal to raise. Shadow, Cloud and Aztec’s daughter, does not appear to be pregnant but I hope I am wrong, and this will be the year that the eight year-old foals. What a lovely filly. Fiesta, Cloud’s little brother and He Who’s lieutenant stallion, reinforces the distance between his band and Morning Star’s. 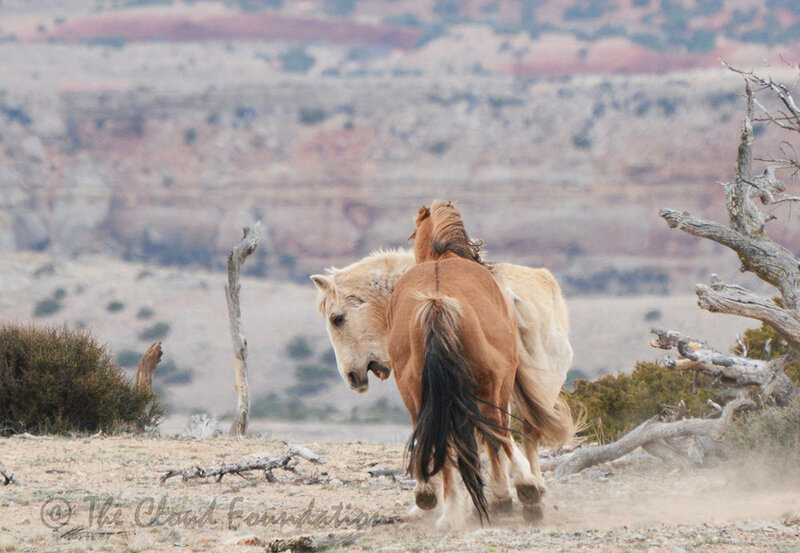 The brief scuffle amounts to nothing, but allows He Who and his two mares, 28 year-old Tonopah and six year-old Jewel to nestle in behind a shelter of junipers and limber pines. 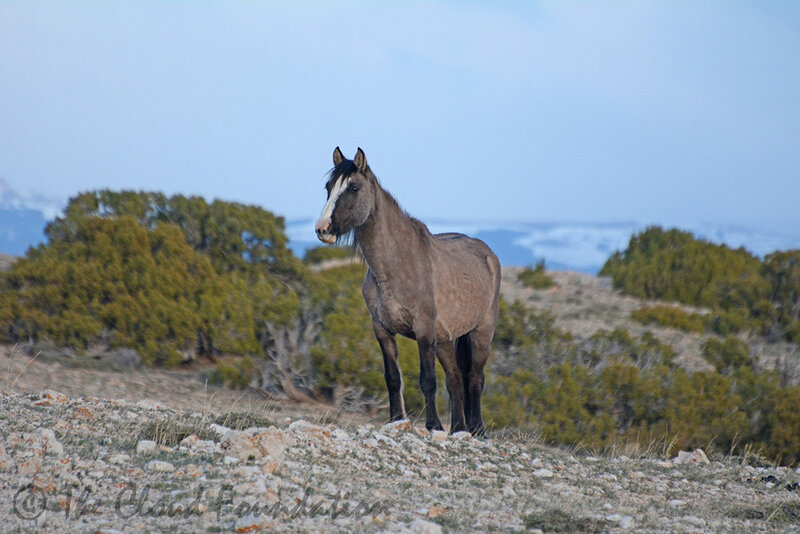 Tonopah, the oldest horse on the Pryor Mountains, looks amazingly young. Jewel, Cloud’s granddaughter, doesn’t particularly care for her so He Who stands between them. We retreat off the windswept mountain, satisfied with our success at finding Cloud and spending some time in his presence. No matter what happens in the future, he has made an indelible mark. 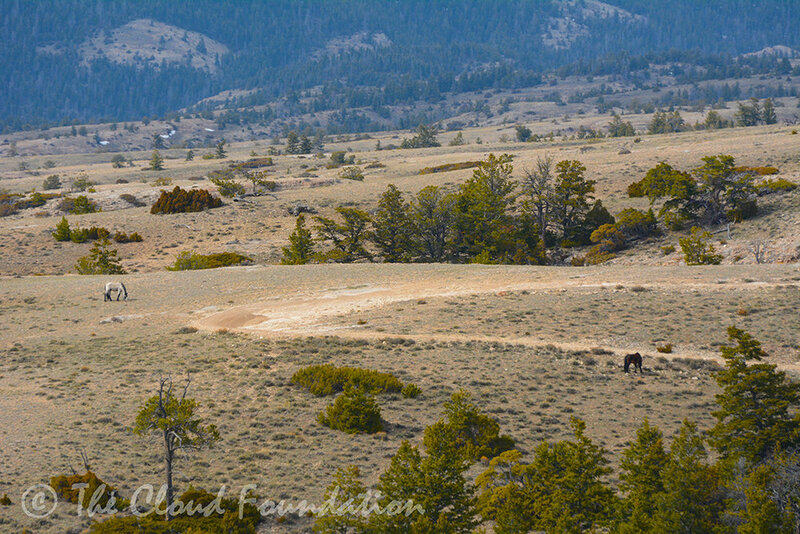 As long as wild horses roam in this challenging and spectacular wilderness his legacy will live on. P.S. Our work to keep wild horses and burros living in freedom only happens through the generous support of our donors. Please do what you can to help us protect them! Thanks.